Hobby Lobby Stores' 600 U.S. craft shops close each Sunday, posting a notice that employees are spending the day with their families and at worship. It's a visible sign that the company is as focused on honoring God as it is on making money. That dual mission is at the core of an ideological showdown over President Barack Obama's health care law, set for argument before the U.S. Supreme Court on Tuesday. Hobby Lobby, a family-owned business that says it looks to the Bible for guidance, is seeking a religious exemption from the requirement that employers cover birth control as part of worker-insurance plans. Hobby Lobby is asking the court to give for-profit corporations the same religious freedoms as individuals, with potentially sweeping rights to opt out of laws they say are immoral. A victory for the company would also put a dent in a health care law that remains under siege on multiple fronts two years after the Supreme Court upheld its central provisions. "Why as a family, because we've incorporated, do I have to give up religious freedoms, which are core to what our nation was founded on?" said Steve Green, the president of the Oklahoma City-based company and son of its founder. The case comes to a court that four years ago expanded corporate speech rights under the First Amendment in the Citizens United campaign-finance case. The Hobby Lobby case focuses on the First Amendment's separate guarantee of "free exercise" of religion, along with a 1993 federal religious-rights law. Critics of Hobby Lobby's position say religious rights are personal -- and impossible to square with the nature of corporations. That's especially the case given that corporations are designed to limit the legal liability of their owners, said Caroline Mala Corbin, a professor at the University of Miami School of Law. Corporations "are not sentient, they have no soul, and they certainly do not have a relationship with God," Corbin said. The justices will hear the Hobby Lobby case alongside a similar dispute involving Conestoga Wood Specialties, a woodworking business owned by a Mennonite family. The companies' lawsuits are among at least 47 filed by for-profit businesses opposed to the contraception requirement, according to the Becket Fund for Religious Liberty, which represents Hobby Lobby. Next week's argument will take place simultaneously with a lower court's consideration of a case that may pose an even more fundamental challenge to the health law. In that case, being argued at a federal appeals court a half-mile away in Washington, opponents of the law contend that people who buy insurance on federally run exchanges aren't eligible for tax credits to cut their premiums. Hobby Lobby was founded in 1970 by David Green, the son of a Christian minister. David Green is now one of five co-equal owners of the company, along with his wife, Barbara, and their three children. All five have signed statements declaring their religious faith and committing to run the business accordingly. The company's religious character can be both subtle and unmistakable. In stores, Christian songs play in instrumental form, recognizable to adherents who know the music though not to other customers, Steve Green says. More visibly, Hobby Lobby buys hundreds of full-page newspaper ads at Christmas and Easter inviting people to "know Jesus as Lord and Savior." At the same time, Hobby Lobby is a growing business, one with $3.3 billion in sales last year and ambitions to add 70 stores this year. It has at least 15,000 full-time employees. The company has long provided health insurance to those employees. 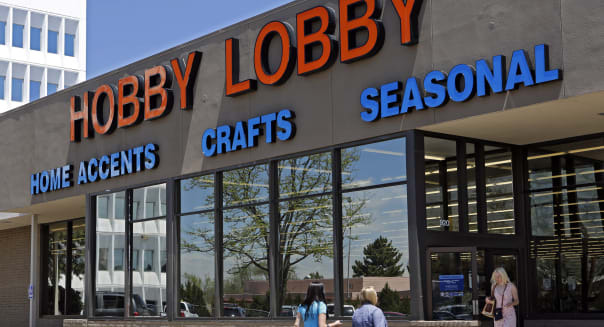 Under its plan, Hobby Lobby covers 16 of the 20 federally approved contraceptives. The ones that aren't are Teva Pharmaceutical Industries' (TEVA) Plan B One-Step, Actavis (ACT) Ella and two types of intrauterine devices. Steve Green said those four can work as "abortifacients" by preventing a fertilized egg from being implanted in the uterus. That's not a universal view. The manufacturers and the U.S. Food and Drug Administration say Plan B and Ella work primarily by preventing the release of an egg from the ovary. The American Medical Association considers pregnancy to begin when a fertilized egg is implanted in the uterus. The high court case focuses less on the science behind contraception than on the reach of the 1993 Religious Freedom Restoration Act, a law enacted to nullify a 1990 Supreme Court decision that cut back constitutional protections for religious practices. The 1993 measure says that only in rare cases may the government "substantially burden a person's exercise of religion." The Obama administration says that provision doesn't cover for-profit corporations. The government also contends that the Greens themselves can't claim a violation of their rights because the birth-control requirement doesn't impose any obligations on them as individuals. Either way, the government says the contraceptive requirement doesn't impinge on religious rights because it is the woman, not the employer, who ultimately decides whether to use contraceptives. "Those decisions by independent third parties are not attributable to the employer that finances the plan or to the individuals who own the company," U.S. Solicitor General Donald Verrilli argued in court papers. The company's lawyers say that argument is a backdoor effort to challenge the sincerity of the Greens' beliefs. The Greens "object to being forced to facilitate abortion by providing abortifacients, and that objection does not turn on the independent decisions of their employees," their lead lawyer, S. Kyle Duncan, contended. The birth-control rule is part of a broader Obama administration effort to ensure coverage for preventive care. The rule stems from the health care law's requirement that insurance plans provided by employers meet minimum standards. %VIRTUAL-article-sponsoredlinks%Opponents say the administration has undermined its own case by carving out an exemption for churches and separately letting religiously affiliated nonprofit groups avoid paying for birth control directly. "The government consistently has said, 'We don't assert an overriding compelling interest to overcome religious objections,' " said Kevin Baine, a Washington lawyer who filed a brief backing the companies on behalf of the libertarian Cato Institute. Administration supporters counter that accommodations for churches and religious nonprofits shouldn't force similar allowances for profit-making corporations. Although Hobby Lobby says it could be fined as much as $475 million a year for noncompliance, supporters of the requirement say the law gives employers another choice: not providing health coverage at all. That would leave employees to buy insurance on the new exchanges set up by the health care law. Employers taking that approach must pay a penalty of as much as $3,000 per employee. "There's no employer mandate," said Walter Dellinger, a Washington lawyer and former solicitor general who filed a brief backing the administration. "It's a myth. You do not have to buy health insurance for your employees."